The Great Garage Challenge- The Big Reveal! You know, 30 days ago I wouldn't have believed that my husband I could have made such a transformation in this disaster of a garage…. heck, even last weekend I still wasn't sure that we would actually reach our goal of having our garage ready for the summer! But after several long days of work this week (which were honestly more my husband's doing than even my own!)…. we have accomplished our goal! 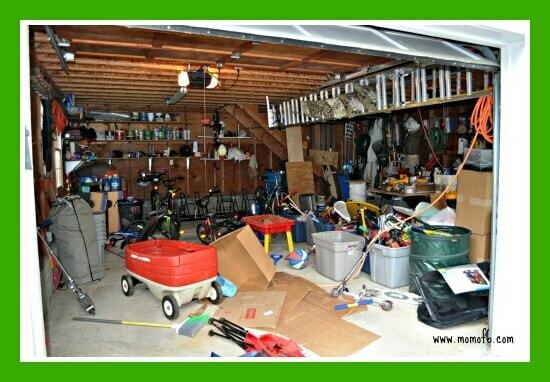 We have actually completed the Great Garage Clean Out Challenge! And after three truckloads of clutter were picked up and taken to the town tag sale, and umpteen bags of clutter were purged into the trash… we actually recovered a huge amount of space! 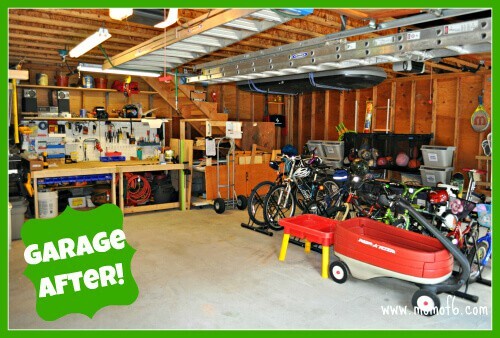 We had some big ideas of what we wanted to do with this space… we wanted to be able to have room for all of the kids toys and all 8 of our bikes on one side of the garage. On the other, my husband was hoping to build a workbench (something he has always wanted to have out in the garage), a place to keep all of our yard maintenance and gardening tools, as well as room to actually park one of our cars in the garage! 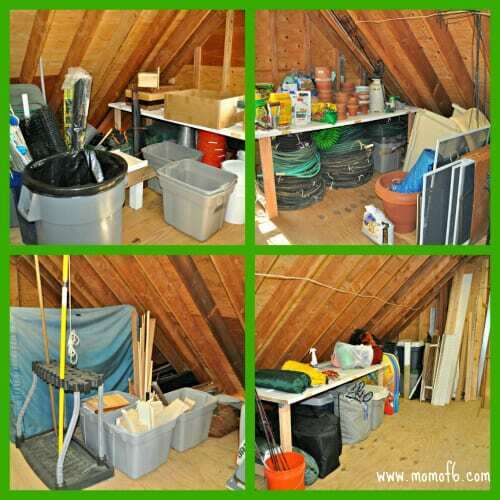 And because we were fortunate enough to have a whole additional floor of storage space on top of the garage (because my husband wisely built a plywood floor onto the garage rafters 10 years ago when we moved in), it enabled us to hold onto even more clutter! Even when we had long ago finished using baby items… we kept them around because they were easily tossed and stored up here. So it was more than time to make a change. A big change. We had done it once already this year. We had taken Org Junkie's 29 Day Challenge and absolutely transformed our basement in just 29 short days. And from there it spun off an array of clean out and decluttering projects throughout the house…. coat closets, our media cabinet, our bathroom, and even our kitchen (in just 7 days). But the garage…. it will still the last huge project looming over our heads. 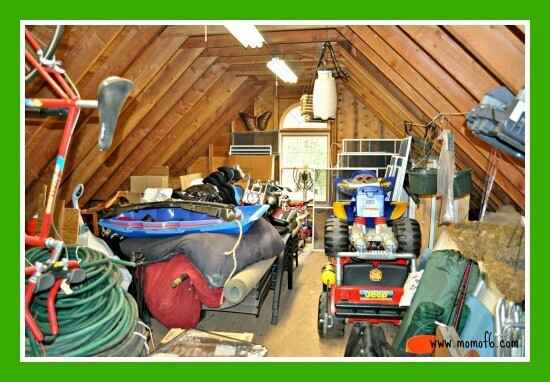 And so I partnered with my mentor in decluttering, Laura from Org Junkie. And using her PROCESS steps, and staying focused on our goal, we got it done, in just 31 days. So ya wanna see it? 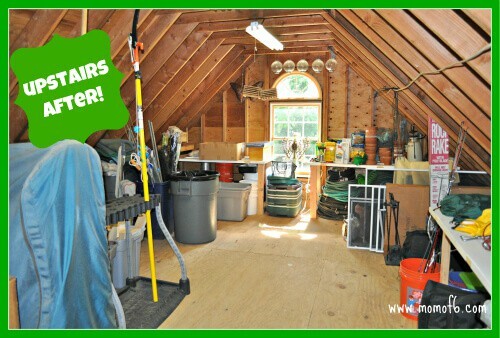 The Great Garage Clean Out… REVEAL! 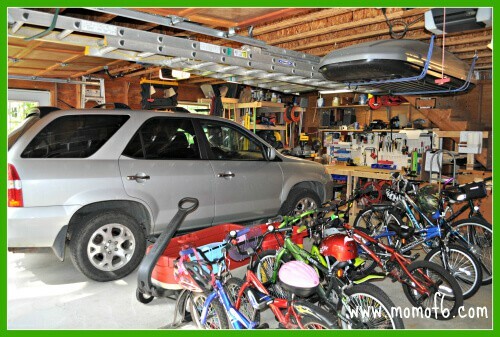 We've created a great way to park all 8 of the bikes in the garage so that the kids can actually get to them easily, and then return them to their parking spaces when they are done. Steve built scooter parking for the 6 scooters (on the wall!) and created storage for baseball bats, lacrosse sticks, tennis rackets, and a kids golf bag too. 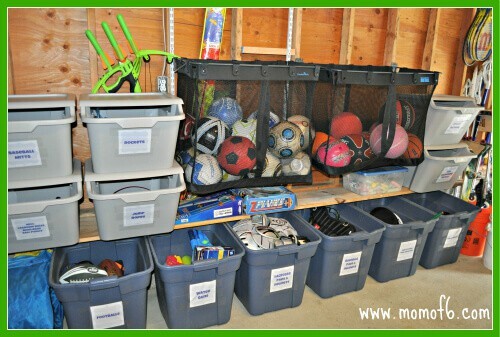 And truly, my favorite part of the new space is my bin wall… which holds all of the kids sports equipment and toys. It is sorted, and organized, and labeled…. and just makes me so happy to look at it! And I told the kids quite clearly that it needs to remain this way…. they are welcome to take everything out and play with it to their hearts content, but when they are finished with it…. back it goes into its proper home (sigh…. 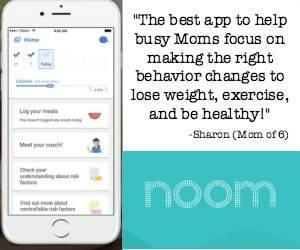 a Mom can dream, right?)! And yes indeed…. Steve's car does actually fit into the garage, quite nicely. With room to spare all around, so we can actually exit the car without banging into stuff. It's the little things that makes us happy, isn't it? The upstairs? Well it is meant to be a storage area for off-season items…. and at the moment it is still holding some stuff that Steve wants to sort through… wood scraps, PVC pieces, metal pipes, and so on. Things he wants to figure out how to save for future projects around the house, but in a way that makes the supplies easy to find and accessible. And truly, once we gathered it together and accumulated it all in one location, I found that I didn't mind having it around so much. It was the pile in the basement, the pile downstairs in the garage and the assorted piles upstairs in the garage that was making me crazy… and making it hard for Steve to figure out what he really owned so that he could put it to good use. But now that we have it all in one place…. we are both much happier about it! I Want to Offer My Deepest Thanks…. To my friend and mentor Laura, who inspired me to take on this quest to declutter my home and my life. One of the things that I have been marveling at this week, is how once I actually tackled an area, purged it, decluttered it, and organized it…. how easy it has been to maintain it in exactly that state! And believe me, if I can tackle these huge and seemingly overwhelming projects… well, then you can too. It just takes a goal, and a plan to achieve it. Okay- it's time for all of you that took the challenge with us to link up your “big reveal”! I can't wait to see them all! 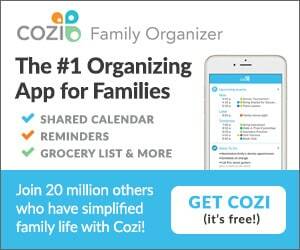 « It’s Time to Plan for…..Summer Camp at Home! Krista- beware of accessing more storage! It gives you carte-blanche to just fill it up with more clutter! (And I should know!). All kidding aside…. finding more storage space is awesome as long as you limit what you put up there to only stuff that you definitely need and want to keep, but just want it kept our of your way. It looks so good!! Thanks for all the inspiration and encouragement throughout this challenge! Thanks Nicole! I am so happy with how it turned out! Oh my goodness what a GREAT job! We did our garage this month and I didn’t even realize it was her challenge. I have pictures taken and the drafts going but haven’t blogged ours yet. Enjoy! 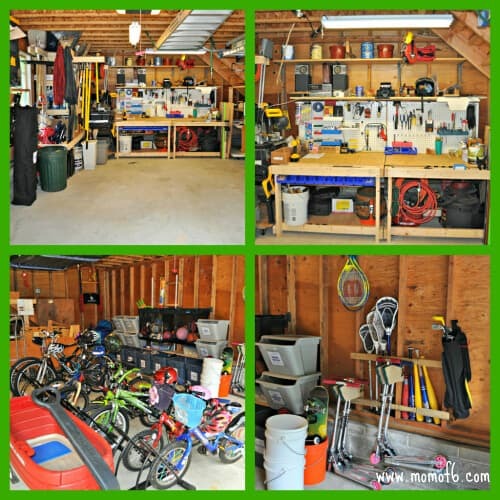 Your garage looks GREAT Sharon! You must be so proud that you accomplished this! I’ve enjoyed following along each week to see your progress. Thanks for sharing your journey with us! You and your Family are amazing! It doesn’t look like the same loft or garage. My car should fit inside by tomorrow. I can’t wait! Great job, and thank you for getting us all moving on this often neglected space. 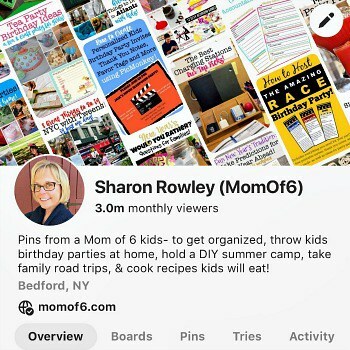 Wow Sharon! Great job, your garage looks amazing! I still want to create your scooter parking in our garage, once we get a couple pieces of wood. I agree with you about keeping our garages this way. 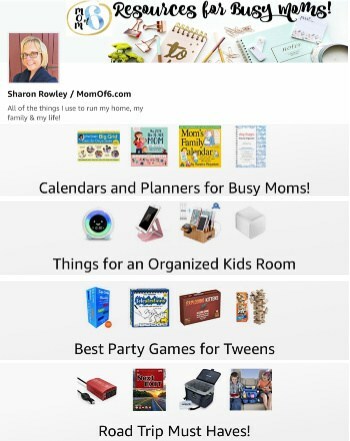 For some reason it seems to be working… Maybe secretly our kids DO like when their things are organized! Great job again, and thanks to you and Laura for hosting this project! It was exactly the motivation I needed!